Organized sports are part of growing up for many children -- and their parents. Sports promote fitness, and they can help teach children valuable lessons about sportsmanship, working hard, winning and losing, and more. But youth sports are not for everyone. 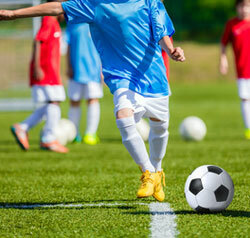 When thinking about children and sports, you should consider several issues, according to the Mayo Clinic. First, make sure the child is old enough. Children up to age 5 probably are too young for organized sports, according to Mayo. Provide younger children with opportunities to use unstructured play for things like running, tumbling, throwing, catching and swimming. This helps children develop coordination and also lets them try out various skills so they can see what they like. Children from about 6 to 9 are often ready for a more organized approach to sports such as T-ball, baseball and softball, running, soccer, gymnastics, tennis and martial arts. Children 10 and up might be ready for more complex sports such as basketball, hockey, volleyball and football. However, it is important to note that children develop at different rates, so when a specific child is ready for a sport depends on the individual child. Particularly with contact sports, it is important that children not compete against children who are more physically mature than they are. If your children are involved in sports, pay special attention to safety issues. Make sure that children have appropriate safety equipment that is sized correctly for them. The adults in charge of the sport should require that safety equipment be worn at all times and that other safety precautions be carefully followed. It also is important that the coaches and other adults involved always practice fairness and good sportsmanship. The emphasis should be on trying hard rather than on winning or losing. After all, very few kids grow up to play sports for a living. But children who participate on teams should be learning valuable lessons about working together toward a common goal, the benefit of practice, getting along with others, and accepting outcomes with grace. Those lessons will serve them well whatever they choose to do in life. Finally, Mayo notes that children should not be forced to participate in a sport – or in sports in general – if they don’t want to. Perhaps the greatest value of sports is to get kids moving, and the hope is that they will continue moving throughout their lives. But there are many other ways to get kids moving and keep them moving. If children don’t want to be on a team, consider hiking, family bike rides, tag or other running games, and similar activities that encourage kids to be active in ways in which they are comfortable.